Justin Thompson of East Millinocket has emerged as a key contributor of late for the Husson University men's basketball team. The freshman guard was a standout at Schenck High School. 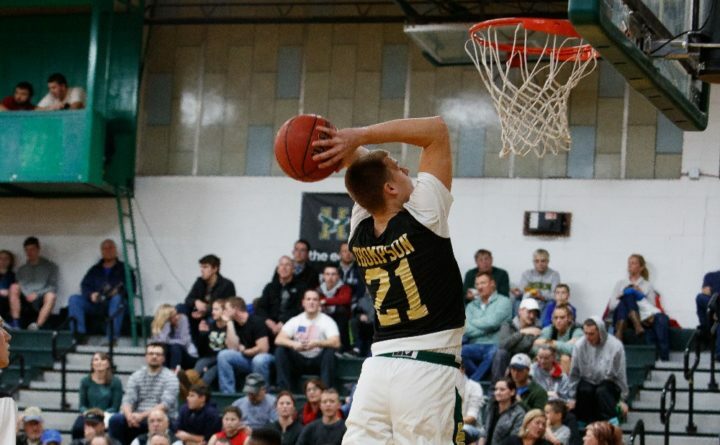 BANGOR, Maine — Perhaps no one at Husson University was more eager for the new men’s basketball season to start than Justin Martin. The 6-foot-6 forward from Winslow and the rest of the Eagles saw their bid for a third straight NCAA Division III Tournament appearance short-circuited in the North Atlantic Conference semifinals last March. Now as the program’s lone returning fourth-year senior, Martin may carry more of a sense of urgency than his teammates as Husson prepares for its season opener against Pine Manor on Saturday at Newman Gymnasium. A football standout and Mr. Basketball award semifinalist during his days at Winslow High School, Martin has been one of Husson’s most reliable players during the past three years. He has played in 81 of 82 contests since his arrival on the Bangor campus and started all 54 of the Eagles’ games the past two years. 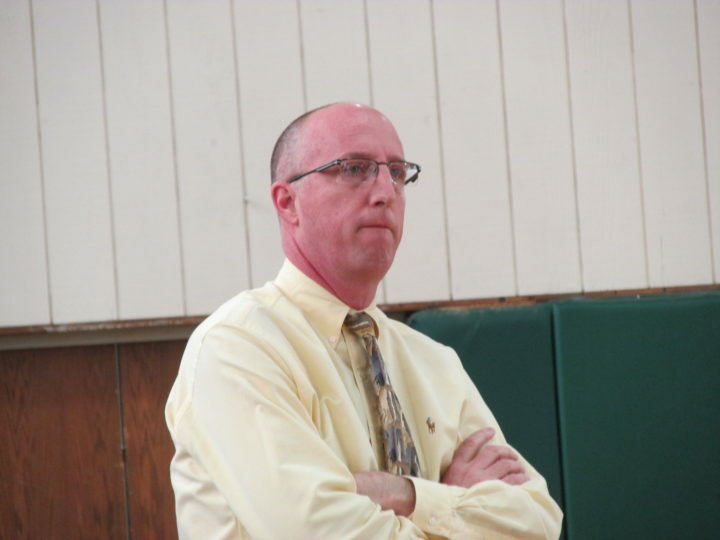 Husson coach Warren Caruso watches the action during the North Atlantic Conference men's basketball game against Maine Maritime Academy in Bangor in this Jan. 10, 2015, file photo. The two-time All-NAC second-team choice has totaled 641 points and 679 rebounds during his career and ranks second in school history with 157 career blocked shots — a combination of contributions that earned him recognition last winter as the NAC Defensive Player of the Year. While Martin often was tasked to guard centers a during Husson’s 19-7 season a year ago, two of Husson’s newest recruits may ease that burden. Trey Sibert, a 6-6 freshman center from Tampa, Florida, amassed 934 points, 654 rebounds and 142 blocks during his high school career, while 6-5 freshman forward Brett Cunningham scored more than 1,500 points while at high school in Harrah, Oklahoma. Sibert and Cunningham are among 10 freshmen and sophomores on Husson’s 14-player roster, and the quality of those classes may be reflected best by the Eagles being the unanimous pick to win the NAC championship in a preseason coaches poll. That sophomore class is led by guard D.J. Bussey, a second-team All-NAC choice last year after averaging 12.9 points per game while shooting 47 percent from the field, 46.2 percent on 3-pointers and 86.5 percent on free throws. Bussey likely will be asked to assume some of the offensive role left by graduated 2,000-point scorer Raheem Anderson, though Caruso expects that to be a shared responsibility. “You look at replacing the scoring over the roster, not necessarily with one guy,” he said. “I think you’ll find as you watch us play that the best shot is the open shot no matter who has it. Other sophomores with starting experience from a year ago are guard Justin Thompson of East Millinocket (7.8 ppg, 4.4 rpg) and forward Cole Thomas (6.1 ppg, 4.2 rpg), while senior guard Kyanti Blyden (7.6 ppg, 3.5 rpg), junior forward Bruce St. Peter of Ellsworth (4.4 ppg, 3.1 rpg) and sophomore guard Corey Kaiser (4.7 ppg, 3.8 rpg) will provide an additional veteran presence. While Sibert and Cunningham are expected to bolster Husson’s frontcourt as first-year players, the freshman that may make the most immediate impact is 6-foot point guard Justice Kendall of Baltimore, Maryland. Husson will face a new-look NAC this year with the departures of Castleton, Green Mountain, Colby-Sawyer and New England College, and the additions of SUNY Canton and UMaine-Presque Isle. The league will maintain its automatic bid to the NCAA Tournament, but the net loss of two schools allows Husson and other NAC members the chance to play four additional nonconference games. In Husson’s case that provides a chance to strengthen its schedule with an eye toward self-improvement as well as bolstering its resume for NCAA consideration if it wins the NAC championship. Husson’s nonconference slate includes four New England Small College Athletic Conference foes in Bates, Bowdoin, Colby and Trinity as well as 2018 NCAA Division III semifinalist Ramapo and fellow NCAA tourney qualifier North Central (Illinois).